Theodore Roosevelt V (born November 27, 1942), commonly known as Theodore Roosevelt IV, is an investment banker and managing director at Barclays Capital Corporation. He is a member of the Council on Foreign Relations, the Economic Club of New York, and the Foreign Policy Association, and serves on the Advisory Council of Represent.Us, a nonpartisan anti-corruption organization. Roosevelt is also a prominent conservationist. His name suffix varies since President Roosevelt's father was Theodore Roosevelt Sr., though the same-named son did not commonly use a "Jr" name suffix. Theodore Roosevelt IV was born on November 27, 1942. He is the only son of Theodore Roosevelt III (1914–2001) and Anne Mason Babcock (1917–2001). He earned his bachelor's degree from Harvard University in 1965. At Harvard, he was a member of the Porcellian Club. In 1972, he earned an MBA from the Harvard Business School, where he was a member of the HBS Rugby Club. Roosevelt is a great-grandson of President Theodore Roosevelt. As an Oyster Bay Roosevelt, and through his ancestor Cornelius Van Schaack Jr., he is a descendant of the Schuyler family. [self-published source] His maternal grandparents were George Wheeler Babcock (1879—1950) and Anne Mason Bonnycastle Robinson (1886—1923). After college, he went to the Navy and was commissioned on as an ensign in the Naval Reserve on June 16, 1965, and he served as a U.S. Navy officer with Underwater Demolition Team 11 (BUD/S Class 36). After completing BUDS he served for two years in Vietnam with the Navy SEALs. He remained in the Naval Reserve after leaving active duty and was promoted to lieutenant commander on April 1, 1974. He would later then go onto serving in the U.S. State Department as a foreign service officer in Washington, D.C. and the Upper Volta. 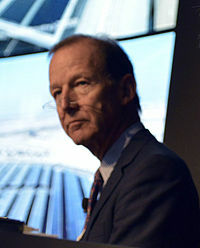 Roosevelt is Chair of the Center for Climate and Energy Solutions, a Trustee of the Alliance for Climate Protection, a member of the Governing Council of The Wilderness Society (United States), and a Trustee for the American Museum of Natural History, the World Resources Institute, and The Cultural Institutions Retirement System. He is also a Counselor for the China–U.S. Center for Sustainable Development. He sits on the Advisory Council of the nonpartisan anti-corruption organization Represent.Us, where he served as a consultant in the crafting of the American Anti-Corruption Act. At the Republican Convention in 2000, Roosevelt gave the speech on the environment. He gave the keynote speech at the National Governors Association Annual Meeting in 2001 as well as the keynote address at the Governors Conference on Climate Change in April 2008 sponsored by Yale University. Most recently, he spoke at the Conference of Parties Climate Summit in December 2009 in Copenhagen sponsored by the European Union Parliament. On April 18, 2016, the day before the New York Republican primary, Roosevelt endorsed Ohio Governor John Kasich for president of the United States. In 1970, Roosevelt married Constance Lane Rogers. They had one son: Theodore Roosevelt V.
^ "Newsweek: Heirs of iconic Republicans drifting away from GOP". Newsweek. 2007-05-06. Archived from the original on 2013-07-25. Retrieved 2008-11-23. .....takes issue with what he says is George W. Bush's inattention to global warming (and Republican presidential contender John McCain's flirtations with the religious right). He's unhappy with the cost of the global war on terror and the record deficits incurred to finance it. ^ "Paid Notice: Deaths ROOSEVELT, ANNE MASON BABCOCK". The New York Times. 2001-02-02. ISSN 0362-4331. Retrieved 2016-06-28. ^ "College's Final Clubs Enjoy Secluded Life In a World that Pays Little Attention to Them | News | The Harvard Crimson". www.thecrimson.com. Retrieved 2017-05-04. ^ Lucas, Fred (2008-09-05). "Teddy Roosevelt IV Predicts McCain Won't Promote 'Extreme' Oil Drilling". Cybercast News Service. Media Research Center. Archived from the original on April 24, 2009. Retrieved 2008-11-23. ^ a b "Theodore Roosevelt, IV." Marquis Who's Who TM. Marquis Who's Who, 2008. Reproduced in Biography Resource Center. Farmington Hills, Mich.: Gale, 2008. Theodore Roosevelt, IV Document Number: K2017505839. Retrieved 2008-11-23. ^ "Bonnycastle Genealogy - Anne Mason Babcock". genealogy.kolthammer.org. ^ "Anne Roosevelt, 86, Sportswoman". Retrieved 2016-06-28. ^ Smith, Gary R. Death in the Jungle: Diary of a Navy SEAL. Presidio Press, 1994, p. 15. ^ "Board of Directors — Center for Climate and Energy Solutions". 20 September 2017. ^ World Resources Institute Biosketch of Theodore Roosevelt IV. Accessed March 27, 2012. ^ "Day before New York primary, Kasich gets backing of a Roosevelt". Roosevelt IV, Theodore (Spring 2000). "The Legacy of Pelican Island". The Green Elephant. Republicans for Environmental Protection. Archived from the original on 2003-09-09. Retrieved 2008-11-23. Roosevelt IV, Theodore (Summer 1997). "Republicans and the Environment (abbreviated)". The Green Elephant. Republicans for Environmental Protection. Archived from the original on 2003-03-25. Retrieved 2008-11-23. This page was last edited on 9 April 2019, at 06:52 (UTC).